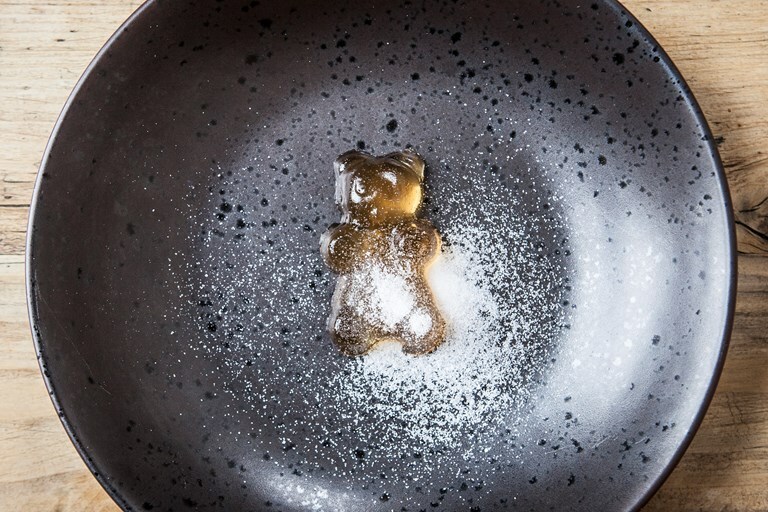 This rum bear jelly recipe from Michael Bremner has become a somewhat iconic dish on his menu at 64 Degrees. These unassuming little bears provide a seriously boozy hit, so don't go eating too many at once. This recipe will yield around 500–550ml jelly, so servings may vary depending on the size of your moulds. If you can't get hold of bear moulds, any other shape will do. 200ml of white rum, or a bit more if you like! To make the jelly, place all the ingredients in a pan and melt the jellies down on a very low heat – alcohol will evaporate at 78.3°C so be careful not to go higher than this. The jelly will easily melt at 70°C, so best not to risk losing the booze!